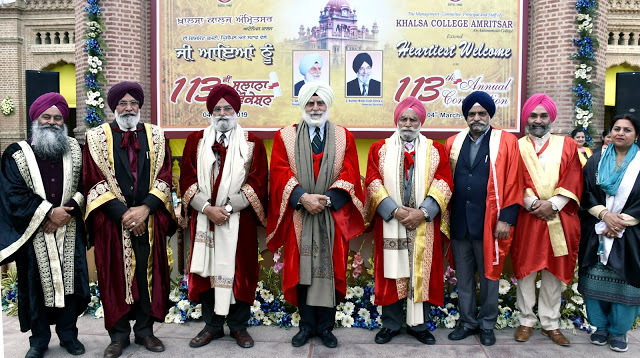 At least 1,450 students from various graduate and post-graduate disciplines were awarded degrees during the 113th annual convocation of Khalsa College on Monday. Forty students were honoured with gold medals. Khalsa College Governing Council (KCGC) president Satyajit Singh Majithia in his convocational address asked the students to focus on opportunities rather than on problems. He encouraged them to have firm faith in Almighty and remain positive saying the education is a key to the success. “We must keep learning the entire life and keenness to gain knowledge must never die”, said Majithia who along with KCGC vice-president Swinder Singh Kathunangal and honorary secretary Rajinder Mohan Singh Chhina also awarded gold medals and honours to 40 other meritorious students. He stressed that aim of education was to develop well meaning personalities for the progress of the society and the nation at large. Principal Mehal Singh read out the details of annual progress report of the college.